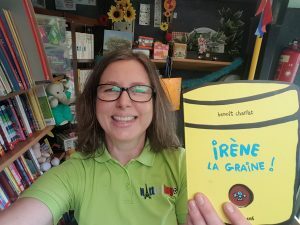 I already owned Nénègle sur la montagne by the same author (click here to find out why it is a favourite of mine with little ones) so was attracted by this story in a bookshop in Laon in April 2018; I then had to buy it, and here is why! Click here to watch a short video of me introducing the story on my YouTube channel. This is the story of a seed which has been made into a character, and we watch it grow. As I read it the 1st time, all in French, the children and I will greet Irène at the beginning and clap her at the end. I will choose a different child to open each one of the flaps and we will all join in with actions to show we understand what Irène does on each page. We will then discuss, in English, what the book tells us about what a seed needs to grow. 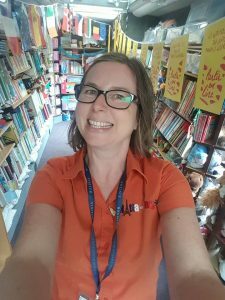 On second reading, the children will be able to repeat each line after me (there is only one on each double page) whilst still joining in with the actions. This is such a cute story about what a seed needs to grow. It is not all exactly factually accurate: for instance a seed would not eat cake, but it enables us to explain that a seed needs feeding, as humans do. The illustrations are beautiful, colourful, clear and fun. The children could either draw a mind map, labelled in French (la graine a besoin de terre, d'eau etc), or their own version / a mini-book of a growing seed, labelled in French too. It will support the work which they do in science. Are you still looking for a story about growing? Click here to read about my favourite ones! Please share in the comments if YOU too know some great stories about growing!